External computer monitoring and control. The FlexStream is ideally suited for creating trace concentration - ppm, ppb, and pptr - mixtures. The FlexStream uses KIN-TEK Trace disposable, refillable and diffusion permeation tubes for over 500 chemicals. FlexStream Gas Feed Permeation Oven Module (GF) (not shown): Most applications can use liquid-filled permeation tubes. However, some compounds (e.g., NO, CO, O2, etc.) have very high vapor pressures and require a special mechanism to achieve desired concentration levels. The Gas Feed Module contains the same oven as an auxiliary Permeation Oven Module (PM) but with additional controls that allow the customer to refill a "customer-refillable" gas-fed permeation tube and to set the operating pressure of the tube. These are special tubes, typically made of stainless steel. Prior to shipment, KIN-TEK determines the tube membrane's certified emission rate for one or more components. In use, the customer typically supplies component gas from a cylinder to initially fill the tube and to periodically recharge it. FlexStream Interface Module (IM) (not shown): The Interface Module contains gas stream interfacing components needed to assure constant gas stream output conditions independent of variations in flow and pressure. The Interface Module is ideal for applications where flow capacity of end use is limited (e.g., filling of gas bags), or when back pressure is required to introduce the output gas stream sample to the device under test. Controls are provided on the front panel for adjusting the output pressure. FlexStream Modular Gas Standards Generator (shown below): The FlexStream Base module and any additional modules can be packaged in stand-alone carrying cases or packaged in one or two 3-module expansion cases as shown below (unused module slots in the expansion case are filled with blank panels). The modules are electronically connected to each other by a short cable on the rear panel. The FlexStream can also be locally or remotely monitored and controlled by a PC or process computer using ModBus connectivity. 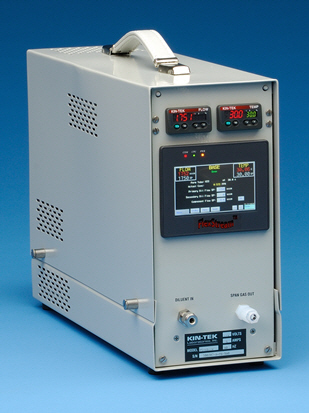 This connectivity allows reading and writing of oven temperature, temperature alarm limits, mode of the instrument (standby, zero, and span), permeation tube properties (component name, emission rate, and certification temperature), flow rate(s), target concentration unit and value, and so forth. KIN-TEK supplies a Windows application named FlexLink with each FlexBase module. This program controls and monitors the FlexSteam by an RS-232 serial or Ethernet link between the PC and the FlexStream. Using FlexLink, the FlexStream can also be controlled and monitored over the internet (or company intranet). The FlexLink executable software is supplied as a standard item with each FlexStream. Although FlexLink is written in National Instruments LabView, LabView is not required to be installed on the host PC. KIN-TEK also provides Modbus driver software free-of-charge. This driver is a LabView VI program for interfacing the FlexStream to a LabView program and is located on the FlexLink executable software CD.